A few weeks ago, Astrophysics Master’s student Tina Wentz gave a great overview of the phenomenon known as the Pioneer Anomaly in our gr-qc journal club. I’m indebted to her for that overview as well as pointing me to relevant papers in the preparation of this post.
. This has become known as the Pioneer anomaly. Possible errors on initial model: Many errors on the initial model were proposed. 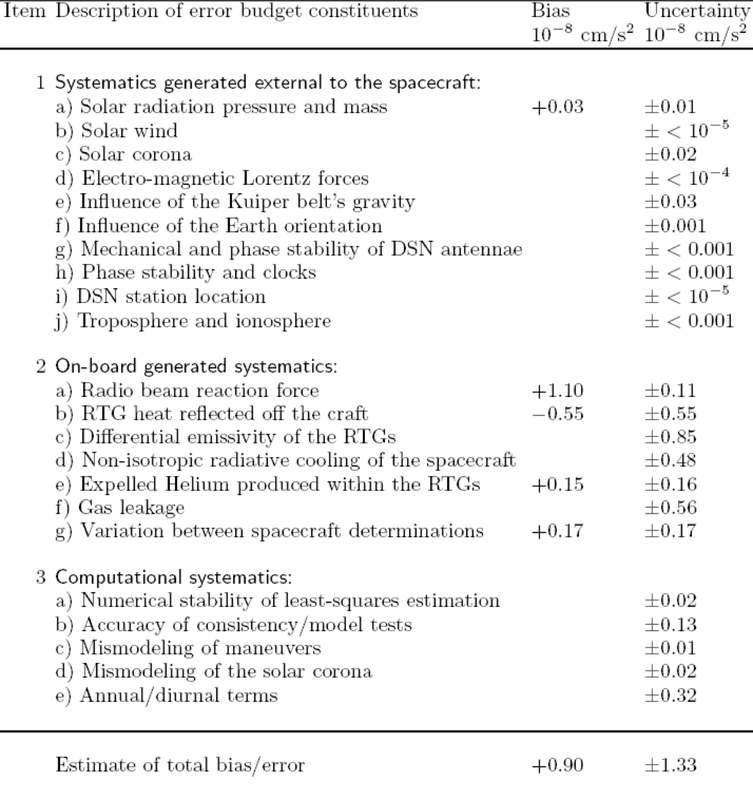 A review paper divided into these into three categories and they are here summarized, 1. sources external to the spacecraft, 2. on board systematics and 3. computational systematics. None of these effects successfully explains the anomaly. Anomalous (unmodeled) acceleration as a function of distance from the Sun. The anomaly is measured by modeling all known effects on the craft, then taking the acceleration measured and subtracting the understood effects off. That means if we failed to account for anything in our model this could be a possible explanation for the anomaly. The explanation could be something as mundane as on board systematics of the craft or as exciting as requiring a modification of our theory of gravitational interactions to explain. Many errors on the initial model were proposed. A review paper divided into these into three categories and they are here summarized, 1. sources external to the spacecraft, 2. on board systematics and 3. computational systematics. None of these effects successfully explains the anomaly. 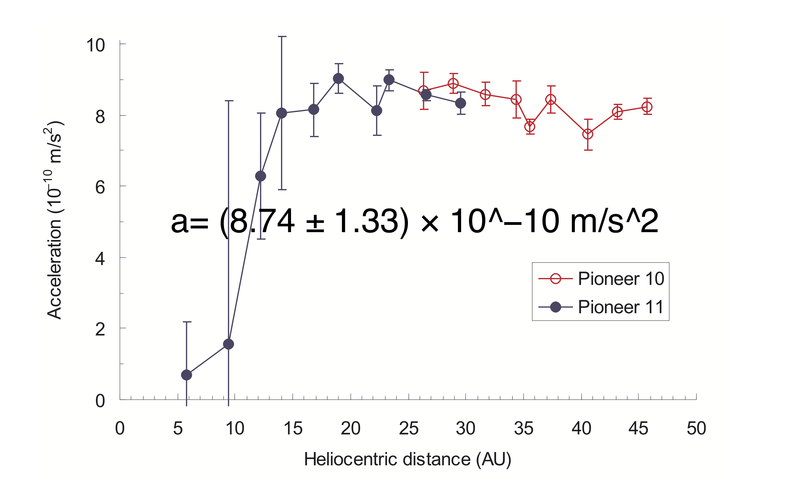 The Pioneer anomaly is so, well, anomalous, in part because of the fact it seems to onset after 15 AU, after which it is approximately constant. Any explanation must also explain this sudden onset which is no mean feat. Moreover, the acceleration is observed for both spacecraft which are traveling in very different directions in the universe. 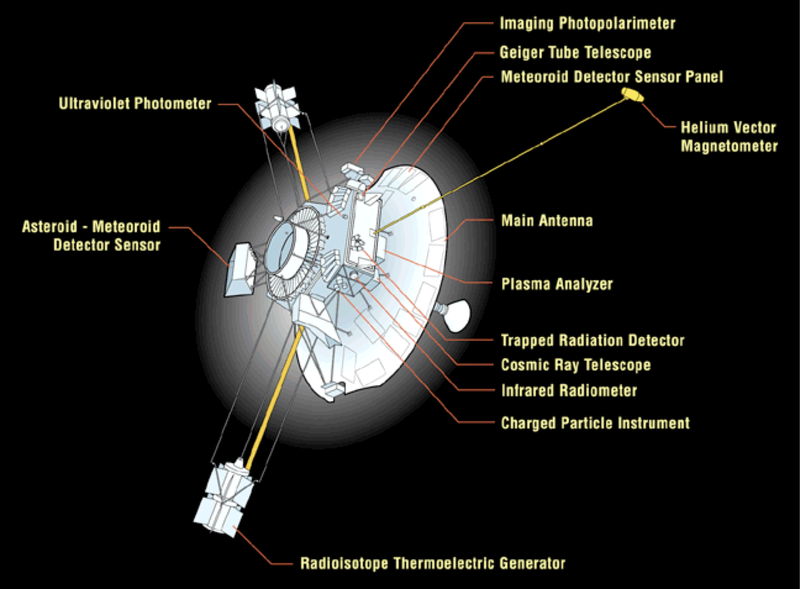 Any explanation, particularly systematics external to the spacecraft, must address why these systematics seem to be the same for both spacecraft in different regions of space. Finally, many tempting explanations, such as radiation pressure from the sun actually result in anomalous acceleration away from not towards the sun. Thus far, after over 7 independent studies which confirm the anomaly there have been countless others which attempt to explain it, none successfully. 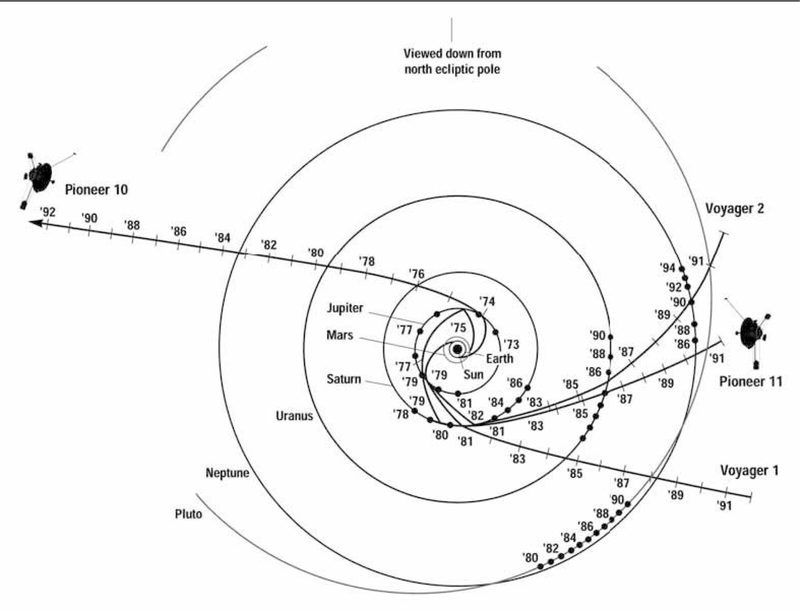 My feelings, echoed by my colleagues in our journal club is that, as exciting as this pointing to a modification of our theory of gravity would be, the most likely explanation is on board systematics of the spacecraft themselves. Since the spacecraft are identical, it is conceivable that some on board effect onset at 15 AU affecting the acceleration. Unless an independently designed spacecraft verifies the anomaly this certainly seems the most plausible explanation.